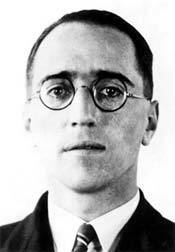 Blumlein was born in the Hampstead section of London on 29 June 1903. His father, Semmy Joseph Blumlein, left Germany at age 18 to seek his fortune elsewhere. His mother, born Jessie Dower, was of Scottish ancestry. Alan Dower Blumlein was such a poor student when he was a child in London that he did not learn to read until he was thirteen years old. He attended various schools including Highgate. He then discovered the wonders of electrical things and from that moment on he pored over detailed reference books on subjects that interested him. Blumlein then excelled in school; in 1923, he received a B.Sc. in electrical technology from City and Guilds College, part of Imperial College. In 1924, he began work for International Western Electric (later Standard Telephone and Cables), where he performed important work on the reduction of crosstalk and developed telephone measuring equipment — notably the transformer ratio arm bridge — and helped establish standards for long-distance telephony. Blumlein was one of the most prolific inventors of the first half of the twentieth century. He earned 128 patents in electronic and audio engineering before he died at the age of 39. By 1929 he was an engineer at Columbia Graphophone, and was appointed to work on monophonic recording, primarily to circumvent the Western Electric patents on electrical recording. Columbia Graphophone in 1931 merged with The Gramophone Company to become Electrical and Musical Industries (EMI). At EMI, Blumlein helped develop many advanced technologies used to record sound, including an important type of microphone called the “moving coil” microphone. In December of 1931, Blumlein patented a remarkable new system of recording that he called “binaural sound.” Binaural sound was similar to what we would call “stereo” today. It used two microphones, recorded two separate recordings, and reproduced them from two separate loudspeakers. It was intended to duplicate the way we hear sounds through our two separate ears. EMI was not quite sure what to do with Blumlein’s invention and put it aside for a few years. However, they had foresight, and in 1931, when the company opened a new studio at Abbey Road in London, Blumlein’s electrical recording system was installed. EMI made the first few stereo recordings and films in the 1930s and then shelved the technology. Blumlein spent the mid-1930s developing electrical circuitry for an electronic method of picture transmission for television. He was the leader of the team that convinced the BBC in 1936 to opt for electrical rather than mechanical television. Along with contributing to the development of this service, Blumlein also produced patents on antennas and cables, cathode-ray tubes and cathode-ray tube circuits, DC restoration and ACG circuits, power supplies, modulation circuits and on various miscellaneous electronic circuits. He next turned his attention to sound detection systems to detect aircraft. Blumlein incorporated the binaural sound system into aircraft sound detectors and displayed the results visually using a cathode ray tube. This system could offer obvious military benefits for a nation at war. But EMI was initially shut out of British radar research because the company was not perceived as a producer of defense equipment. However, Blumlein brought EMI into radar research by helping develop an airborne interception system that could detect aircraft by night. Along with E.L.C. White, Blumlein designed a 60 MHz radar in 1939. The latter radar would have a dramatic impact on the Battle of the Atlantic and the Allies' long range bombing in Germany. Blumlein was part of a team testing the H2S system, which could locate and detect targets from the air regardless of weather conditions. Tragically, he and many of the other members of the scientific development team were killed in a 1942 plane crash that also destroyed the H2S system prototype. One Air Chief Marshall called his death “a catastrophe,” while the Secretary of State for Air called it “a national disaster.” The detection system was completed later in the war by a new research team. When interest in stereo sound revived in the 1950s, Blumlein’s work was remembered. Around 1957, both RCA and EMI were close to offering a new stereo system based on the existing long playing (LP) record, which had been introduced in 1949. The two companies teamed up and shared information so their products would be compatible. The next year, in 1958, the first stereo records appeared, and Blumlein was honored posthumously by the Audio Engineering Society of the USA. Robert Charles Alexander. Focal Press, 1999. 2) The Life and Times of A. D. Blumlein. Rusell Burns. IEE History of Technology Series, 2000.